Christmas gift-giving was a real challenge for me this year. Even up to the last few days before the holiday I was scrambling for ideas. I was feeling like my kids didn't really need anything. We have plenty of toys. The baby is drowning in three sisters worth of hand-me-downs. Their rooms are totally messy which makes me even less excited to go out and buy more "things" to add to that chaos. But my kids aren't quite at the age where they appreciate a hive of bees or a goat. Ideally I like to have one "winner" gift. Something that will thrill their socks off and then pepper the rest of the gift-giving with little things like books, underwear, chapstick and pencils. Finally at the very last minute this year, and thanks to an in-store phone call to my sister, inspiration arrived. For Mary, it was actually easy–she's been begging for an (inexpensive) digital camera since the first hint of holiday decorations started appearing on store shelves. (So that's like, what? October?) And for her slightly absent-minded personality, she's handled the responsibility impressively well. The camera still works AND she knows where it is. She also had on this on her list at number 10: That Birdy will stay little forever. Be still my heart. She immediately got extra points for that one. So, as I was standing in the local Feed Mill staring at hay racks and shedding blades, nothing was inspiring me. But in a desperate phone call to my sister and a "What are you getting your kids?" conversation, I hung up the phone with a plan. My girl was ready for her own sewing machine. If you've caught any of my whining around these parts, we've been without a sewing machine in this house for almost three years. I've been borrowing and begging which is no fun. And Emma loves to sew. Even with my majorly budget-minded Christmas, I was still able to get her a very basic, entry-level Singer. I've never really given Emma specific sewing lessons. She knows the basics and nothing more. But watching her navigate the creative sewing waters is exciting. It's like when toddlers first learn to dance. The minute they start to bop to the beat, you don't whisk them off to dance classes. There is so much creativity and growth in them learning how to swing their hips and bend at the knees. They're way more creative and free without the boundaries of proper dancing technique. And I'm finding the same to be true with Emma's sewing. I know she knows enough to be safe. She knows that if she doesn't want her stitches to pull out she needs to do a little back-and-forth at the beginning and end. But otherwise, she is a blank slate behind the presser foot. The possibilities are endless. I know that eventually what she wants to make will get more complicated and some instruction will be required. 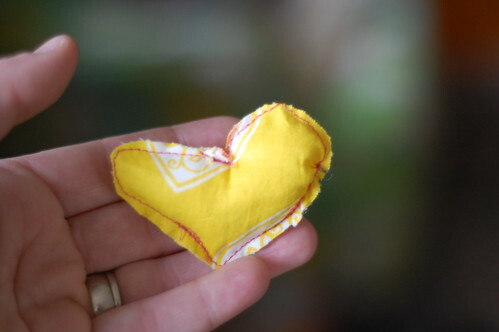 But for now, my house is peppered with tiny hearts, miniature pouches and endless possibilities. The dining room curtains and pleated skirts can wait…. This is a good christmas gift. You don’t need to go with so many people in stores. awesome! i love it when kids use their creativity with endless bounds. so much good comes from that. great gift, molly! Fab gift!! She must be so excited!! I got my daughter a sewing machine a couple of years ago and it was definitely the right gift. 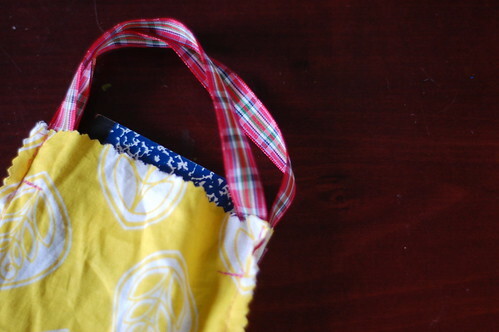 This year they sewed up a gazillion cloth gift bags…..wrapping paper begone! A perfect gift. I gave my kiddos a vintage singer I found on CL for $20. They love using it. I have even considered making it a hand-crank machine. wonderful! lucky, Emma, and great mom to just let her go. your thoughts are so similiar to my own, what to buy my children that have so much already? and, how to make it sensible and not just something we are throwing away money on. my daughter got a machine 3 years ago and just loves it. it is old and second-hand but does everything she needs it to do. now my son is starting to make little creations too. That’s a great story! My nephew wanted a sewing machine last year and for a while his siblings were showered with tiny stuffed ‘animals’ and ninja-style headbands 🙂 My mom sewed when I was a kid but I didn’t really pick it up until she re-taught me how to use the machine, when I was 21. Oh I love that tiny heart! What a sweet gift. Makes me want to dust off my sewing machine. . . and think of gifts for my boys (for next holiday, thankfully, which is so far away) that are right on target. Your blog never ceases to amaze me, it is very well written and organized.